If you’ve followed my blog for any length of time, you may have picked up on the fact that I’m not a Calvinist. (I’m pretty far from it.) But what you may not know is that I used to be one. I didn’t just have Calvinistic beliefs—I was a fighting apologist for Calvinism. I remember one evening when a debate with friends over Calvinism lasted a good eight hours! Thankfully, those and other non-Calvinist friends had a lot of patience with me, and I gradually came to see the light. 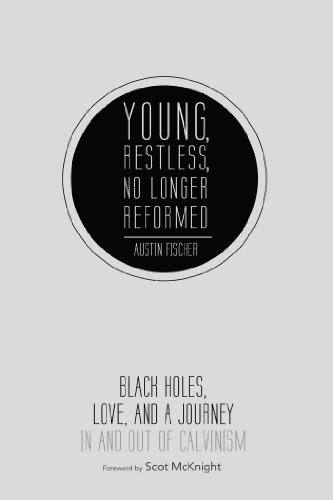 So I can see a lot of my own story in Austin Fischer’s Young, Restless, No Longer Reformed: Black Holes, Love, and a Journey In and Out of Calvinism. This book is much more than an argument against Calvinism. It’s really an examination of how and why we do theology. Austin believes that “theology and biography belong together.” And he structures his book accordingly. This is a journey. He doesn’t pretend to have all the answers. (In fact, he devotes a whole chapter to the problems he still sees in his current view.) But what Austin does have—what he invites us to share with him—is a beautiful vision of the crucified God. The book follows Austin as his confidence in the Bible drove him to Calvinism, as that same confidence ultimately drove him away from Calvinism, and as he finally came to see God as he truly is. The God revealed in Jesus Christ does not hoard his power like earthly rulers—our God delights in giving his power away. By his sovereign decree, he has relinquished his right to absolute, domineering control, so that he may in return receive true, uncoerced love. But I won’t spoil every detail of the book for you. I’ll just encourage you to get a copy and read it yourself. It was a very quick and enjoyable read for me—I breezed through it in one weekend (and I’m not a terribly fast reader). I highly recommend Young, Restless, No Longer Reformed to all of my friends, whether you’re a Calvinist or not. Even if it doesn’t change your mind, the journey will be worth it. You can pick it up as a paperback or as a Kindle eBook. I’d like to thank Cascade Books for sending me a copy to review.